Any visit to Colorado will centre around reaching those rugged Rocky Mountain Highs. But there are some places that highways and hiking trails can’t take you. Colorado boasts a rich railroad history, including pioneering narrow gauge mountain tracks ascending high into the alpine and providing unique access to some of the state’s most beautiful, diverse and remote landscapes. Lovingly restored since their Wild West heyday, the state’s historic train routes today provide visitors with maximum scenic reward for minimum effort, all in ultimate style. These three epic railroad adventures are the best of the bunch. Location: The railroad links the towns of Silverton and Durango in SW Colorado. Length and duration: The route spans 45 miles and takes 3.5 hours to ride one-way. 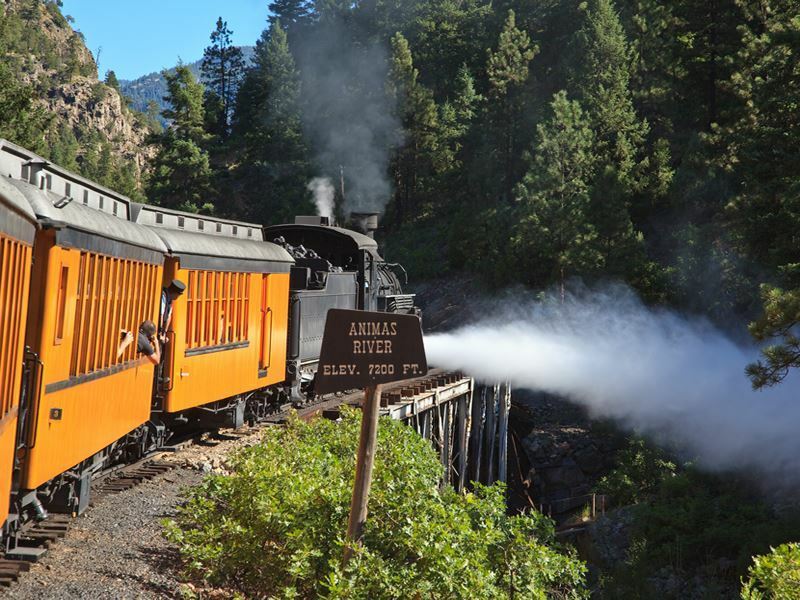 What: The grandest of all Colorado’s railways and hailed as one of the very best railroad adventures in the US, a journey along the Durango & Silverton promises an unforgettable experience for all. The railroad is one of the last remaining of its type in the country and recognised for both its historic civil engineering and national historic landmark status. Historical significance: The track was laid in 1882, helping to fuel the mining boom of the Wild West era, and has been in continuous operation ever since. 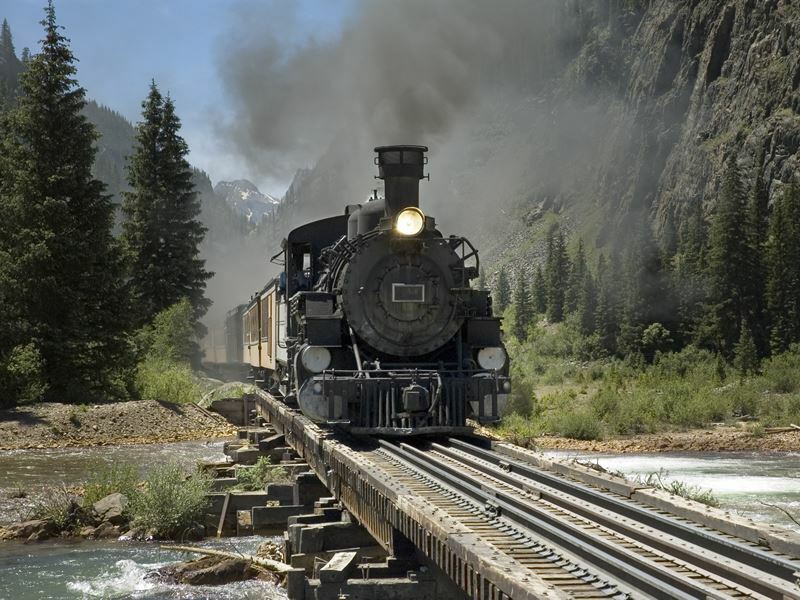 The steam-powered locomotive was originally used to transport silver and gold, as well as the miners, cowboys and settlers who shaped this iconic era. The route later gained popularity as a tourist attraction, enabling visitors to relive the experience of passengers of old, boarding at the same depot and riding rolling stock original to the line. Costumed guides and historic narration onboard provide interesting facts about the surrounding area and paint a vivid picture of the lives of those who built and first rode the railway. The route and its scenery: The railroad ascends the Animas River Canyon against a jaw-dropping alpine backdroup of jagged peaks, meadows, forests and crystal clear lakes. As you climb the canyon, all signs of civilisation vanish, bar the railroad itself, and you’ll be met with magnificent views of the towering San Juan Mountains and the gushing glacial waters of the Animas 200 feet below. The tour: There are two signature tours on offer. The Round Trip Silverton Train Tour that stops for a couple of hours in Silverton, taking 9 hours in total. And the Skyway Tour that includes a bonus bus ride on US highway 550’s scenic San Juan Skyway. The latter option operates on a varying schedule, providing more flexibility, whilst the addition of a bus ride offers a different perspective on the magnificent mountain landscape. Highlights and extras: The main tour includes a 2 hour stop in the old mining ghost town of Silverton with enough time to explore the historic downtown, browse the many boutiques and enjoy a bite to eat. 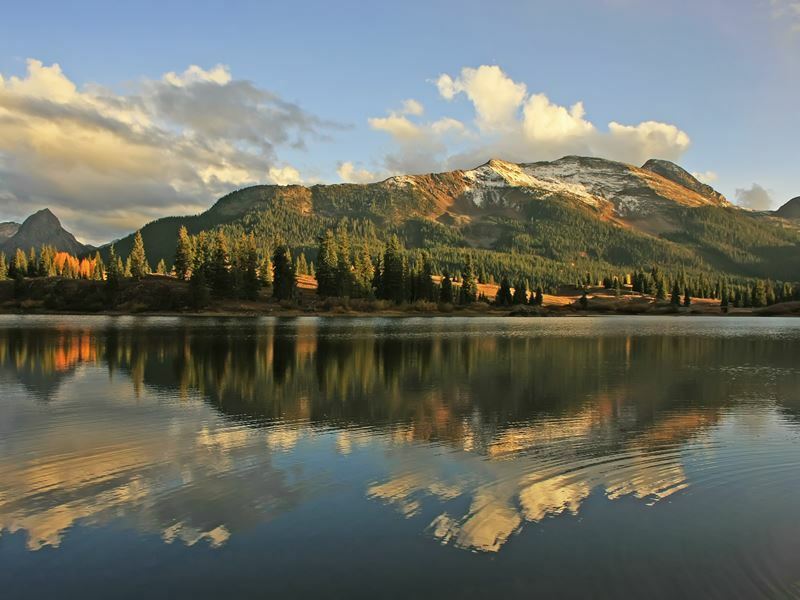 Meanwhile, at the other end of the line, Durango is a popular mountain resort providing access to plenty of recreational activities nearby, from skiing and mountain biking, to fishing, rafting, hiking and historic sightseeing. For passengers in search of something more, the railroad recently launched an open-air car, “Knight Sky”, that offers riders unobscured 360 degree views of the Animas Jorge and San Juan wilderness. Meanwhile, winter visitors should plan a trip aboard the hugely popular Polar Express complete with costumed staff, personal chefs, presents, carol singing and hot chocolate - a perfect holiday treat for the whole family. Adventure-seekers can disembark at various points along the route to access otherwise unreachable areas of the San Juan National Forest and Weminuche Wilderness. There are limitless opportunities for independent hiking, biking, fishing and backcountry camping. Adventure Packages are also available, combining the historic stream train ride with rafting, 4-wheel drive excursions or canopy tours of the surrounding old-growth forest. Location: The track starts and ends at Manitou Springs, taking visitors up to the summit of Pike’s Peak. 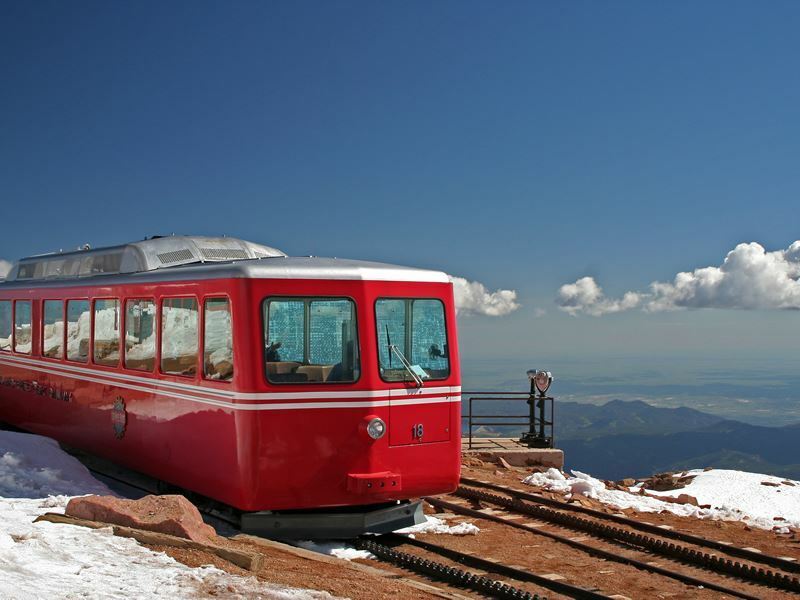 What: The Manitou Springs and Pike’s Peak Cog Railway is the world’s highest cog railway (and the highest railway of any kind in North America). It scales the dizzying heights of the spectacular Pike’s Peak, providing visitors with access to staggering scenery in ultimate style and comfort. A feat of engineering: The first train ride along this track was successfully completed in 1891 and has transported passengers up and down the peak ever since. Naturally, the railroad was built for sharp inclines with a cog design where the wheels are fitted to the track, turning much like the cogs inside a clock, which allows for much steeper climbing. The route and its scenery: This rail journey offers the perfect blend of old and new: a vintage track and lovingly restored historic station, combined with modern Swiss-style carriages with wide windows offering stunning vantage points as you travel through the alpine terrain. 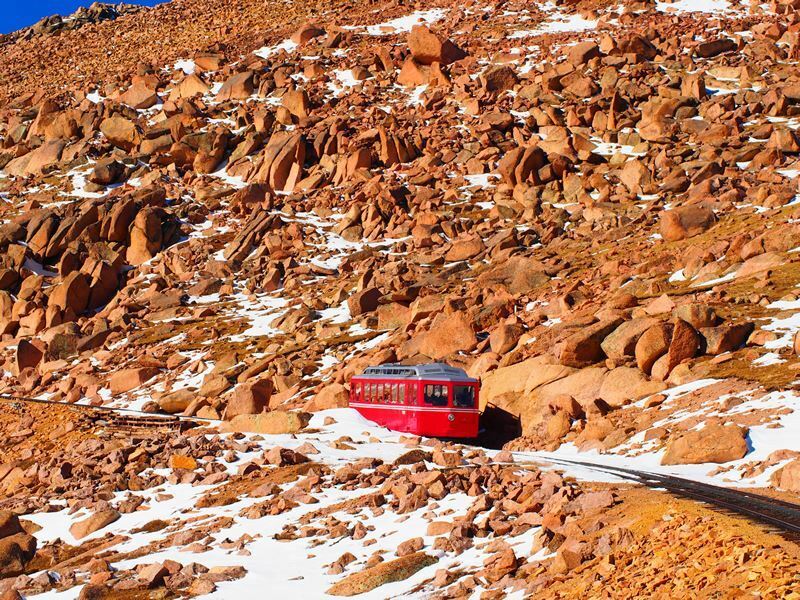 A ride up this exhilarating cog railway promises unbeatable views as you progress up through four habitat zones, from lush meadows to sparse alpine tundra, thick pine forests to steep canyons lined with boulder fields. Also be on the lookout for wildlife as you ride - Pike’s Peak is home to some of Colorado’s largest populations of bighorn sheep and yellow-bellied marmots. The tour: Summiting at over 14,000 feet, you’ll witness the incredible sight of the snow-covered Rocky mountains spread out beneath you, as well as panoramic vistas extending into several neighbouring states. In actual fact, the breath-taking views from this iconic mountain inspired the lyrics to the song “America the Beautiful”, and the experience will leave you in no doubt as to why. Highlights and extras: Trains operate year-round, though not always to the summit. For something special, the December Santa Train runs up to the historic Minnehaha Siding. Accompanied by a jolly pack of elves, gifts, music, hot chocolate and story-telling create a brilliant experience for families with kids. Those looking to linger in the area should head to the Garden of the Gods, a National Natural Landmark home to towering red sandstone rock formations and copious plant and animal life. The town of Manitou Springs is another must, offering endless possibilities for outdoors pursuits. Those looking for a challenge can hike the precipitous Manitou Incline, following the route of the former Incline Railway which fell into disuse in 1990. In fact, the entire Pike’s Peak, Manitou Springs and Colorado Springs region is a world-class destination for hiking and adventure, with no shortage of fantastic trails for all ages and abilities. Location: This is one of Colorado’s most accessible railroad adventures, a short 45 minute drive from Denver up the awe-inspiring Clear Creek Canyon to Georgetown. Length and duration: The railroad connects Georgetown and Silver Plume, a journey of 75 minutes. What: Nestled high in the Rocky Mountains, the historic Georgetown Loop Railroad was a true marvel of engineering for its time. It still wows visitors today with its twisty tracks, dizzying elevation gains and mesmerising views. 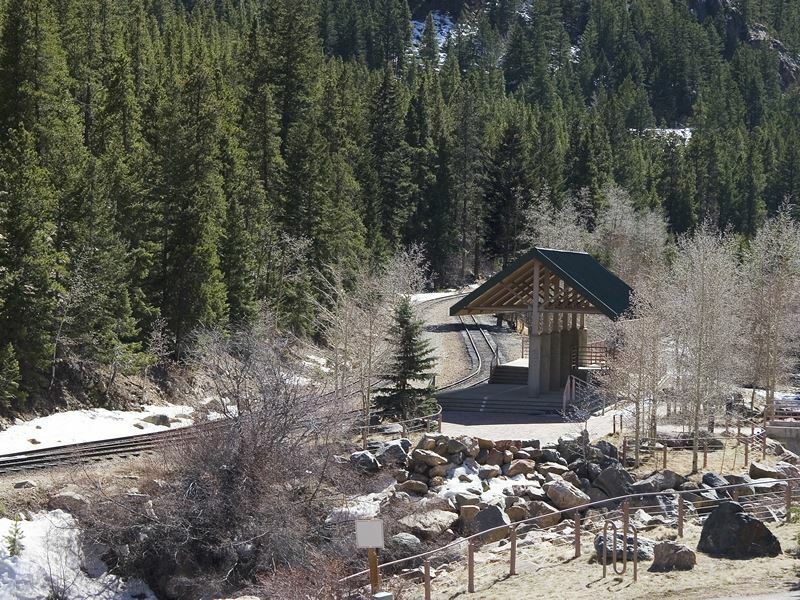 Historical significance: This narrow gauge railroad was built to connect the mining towns of Georgetown and Silver Plume. The towns are only 2 miles apart but the steep narrow canyon meant the railroad was designed as a corkscrew which covers twice the distance. The track gradually ascends more than 600 feet, encompassing multiple horse shoe curves and traversing four bridges across Clear Creek. It was completed in 1884 and used for both passengers and freight, before gaining fame as one of Colorado’s first visitor attractions. 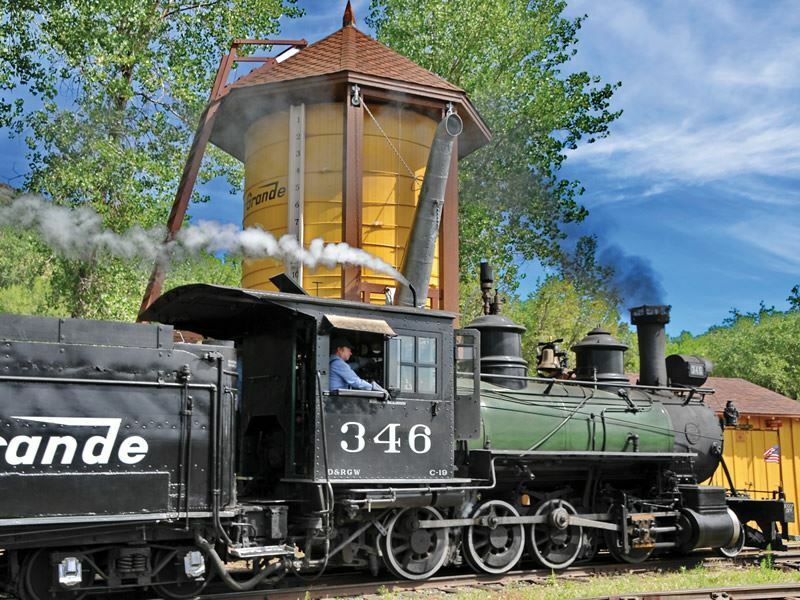 The route and its scenery: Propelled by steam and diesel locomotives, you’ll wind your way up through scenic terrain, past forests, steep cliffs and high peaks on a quintessential Colorado train experience. A definite highlight is the traverse over the huge Devil’s Gate bridge that spans up to 95 ft as it crosses the top of the gorge. Highlights and extras: There are numerous themed train rides that run according to the season, from a fall colours train combined with a hike to see foliage, food-themed trains in summer (how about some BBQ, steak & lobster or wine and d’oeuvres as you ride? ), as well as a magical Christmas light show from early November. Numerous seasonal events and activities add to the fun, from Oktoberfest and Pumpkin fest, to Santa-themed adventures and even a bighorn sheep festival. 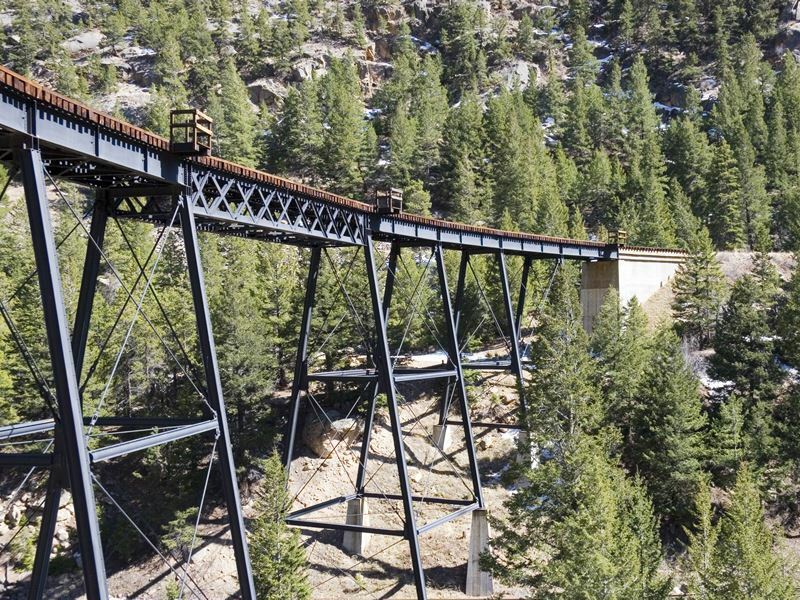 A popular add-on to the rail journey is a walking tour of the nearby Lebanon silver mine. Venture as deep as 900 feet into a historic mining tunnel bored into Leavenworth Mountain. Inspect rich veins of silver in the rock, marvel at century-old stalactites and listen as your guide explains the trials and exhilarations of early-day mining life. Historic Georgetown is also well worth a visit. Nicknamed the “Silver Queen of Colorado”, the town was at the epicentre of the state’s mining industry and still preserves many Victorian structures and artefacts from its heyday. A fantastic place to either kick start or end your railroad adventures is the Colorado Railroad Museum, located just 12 miles west of downtown Denver. Established in 1959 to celebrate the state’s pioneering railroad achievements and preserve its rich heritage, the museum is a veritable treasure trove for train fans of all ages. It features more than 100 narrow and standard gauge locomotives, coaches, cabooses, passenger and freight cars, spread across an impressive 15-acre railyard. Best of all, the trains aren’t just for admiring – rides are held daily throughout the summer months. Meanwhile, exhibition galleries, a roundhouse restoration facility, impressive library and working turntable complete the picture, all bringing Colorado’s flamboyant history to life in vivid detail. Finally, be sure to pick up a memento of your visit at the celebrated Depot General Store, packed with every train-related souvenir imaginable.